When you’re a backup quarterback behind a true legend in a top-5 football program, all you do is compete. You compete to show your teammates and your coaches you can come in when the team needs you most. You compete for valuable reps with the starting offense and to not be delegated to scout team duties. Most importantly, you compete to put yourself first in line to be “The Man” when the current starter must move on from the program. 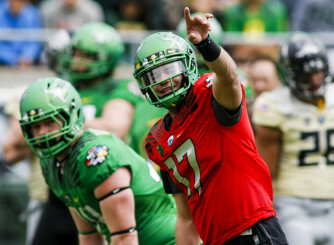 Redshirt junior Jeff Lockie, the current front-runner in Oregon’s quarterback race to replace Heisman Trophy winner Marcus Mariota, is on the verge of finally earning the job he’s spent the last three years working for, but first he must compete one last time to fend off every challenger from true freshman Travis Jonsen to Eastern Washington transfer Vernon Adams. Jake Rodrigues battling with Lockie to determine the 2013 backup situation. Lockie’s journey to the starting job started three years ago when he began competing with Jake Rodrigues for the backup quarterback position behind Mariota after the transfer of Bryan Bennett. 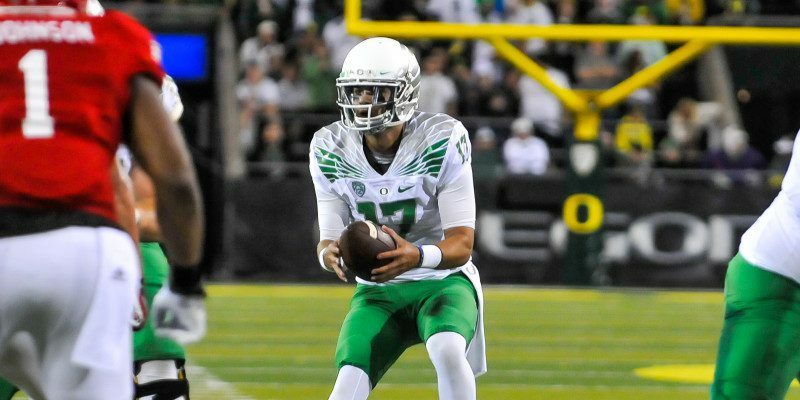 The contest between Lockie and Rodrigues was so close for the entire two years they battled it out for the job that head coach Mark Helfrich refused to name a backup and labeled the backup position as a “2a and 2b” situation. In fact, a quick look at a 2013 depth chart posted on goducks.com shows that the backup position was even labeled as Lockie or Rodrigues. The competition only ended when Rodrigues transferred away from the program in May of 2014. It’s still unclear whether Rodrigues had started to fall behind in the duel for the backup job, but his departure left Lockie in position to be the clear backup. While the competition clearly tested both quarterbacks both physically and mentally, Lockie views his battle with Rodrigues as good practice for his current competition to be the starter. Lockie’s experience gives him a leg up over the competition. Lockie understands how to compete in the spring. It’s a routine he’s repeated over and over again. Just because the job he’s competing for involves a lot more publicity and there are a few more challengers, doesn’t mean anything is different for the redshirt junior quarterback. Given his calm and familiar approach during such high stakes practices, it was no surprise to see him emerge as a leader over the spring session. Even the young Quarterbacks he’s competing with view him as a leader and a role model. Jeff Lockie catches flea-flicker toss-back that results in a 50-pass to Byron Marshall. The culmination of all this experience and hard work was capped of in the Spring Game when Lockie looked and performed like the starter going 9-for-9 with 223 yards and 3 touchdowns. While the others had their moments, Lockie moved the offense consistently and made some big plays, including two passes that were turned into 50-yard gains. 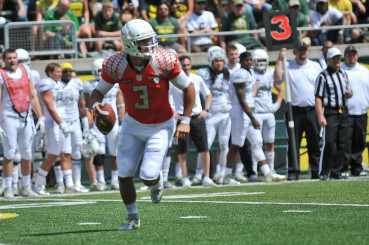 But though Lockie dominated the spring and emerged as the leader in the club house among quarterbacks already on campus, the starting job is not his until he fends off Adams, who arrives in Eugene this summer. Adams is an incredibly athletic and accomplished passer who dominated at the FCS level with the Eagles. Overlooked by scouts due to his lack of size, Adams thrived in his time at EWU throwing for 10,548 yards and was responsible for 121 touchdowns, including impressive performances against such PAC-12 teams as Oregon State and Washington. 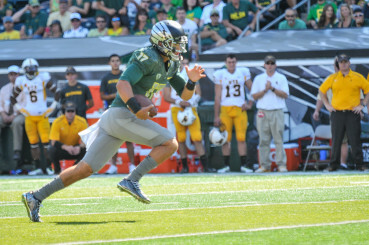 Adams, however, does face a few more challenges than the other quarterbacks on campus. He’ll have a small window of opportunity to manufacture some chemistry with his teammates and learn the offense. More importantly, Lockie and the other quarterbacks have all had time to show off their skills to the coaches and establish their leadership with the team, while Adams has had to work out on his own. Although Adams presents a huge threat to Jeff Lockie’s goal to achieve the starting job, there’s only one thing that’s certain: Lockie will compete like he always has. 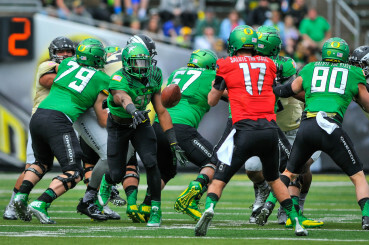 Jake RodriguesJeff LockieOregon DucksOregon QB CompeitionVernon Adams Jr.